When sea lions suffered seizures and birds and porpoises started dying on the California coast last year, scientists weren’t entirely surprised. Toxic algae is known to harm marine mammals. But when researchers found enormous amounts of toxin in a pelican that had been slurping anchovies, they decided to sample fresh-caught fish. To their surprise, they found toxins at such dangerous levels in anchovy meat that the state urged people to immediately stop eating them. The algae bloom that blanketed the West Coast in 2015 was the most toxic one ever recorded in that region. But from the fjords of South America to the waters of the Arabian Sea, harmful blooms, perhaps accelerated by ocean warming and other shifts linked to climate change, are wreaking more havoc on ocean life and people. And many scientists project they will get worse. “What emerged from last year’s event is just how little we really know about what these things can do,” says Raphael Kudela, a toxic algae expert at the University of California, Santa Cruz. It’s been understood for decades, for example, that nutrients, such as fertilizer and livestock waste that flush off farms and into the Mississippi River, can fuel harmful blooms in the ocean, driving low-oxygen dead zones like the one in the Gulf of Mexico. Such events have been on the rise around the world, as population centers boom and more nitrogen and other waste washes out to sea. But scientists also now see troubling evidence of harmful algae in places nearly devoid of people. They’re seeing blooms last longer and spread wider and become more toxic simply when waters warm. And some are finding that even in places overburdened by poor waste management, climate-related shifts in weather may already be exacerbating problems. Fish kills stemming from harmful algal blooms are on the rise off the coast of Oman. Earlier this year, algae blooms suffocated millions of salmon in South America, enough to fill 14 Olympic swimming pools. Another bloom is a suspect in the death last year of more than 300 sei whales in Chile. In the north, blooms are on the rise in places like Greenland, where some scientists suspect the shift is actually melting ice. Just this year, scientists showed that domoic acid from toxic algae was showing up in walrus, bowhead whales, beluga, and fur seals in Alaska’s Arctic, where such algae species weren’t believed to be common. Kathi Lefebvre, a toxic algae expert with the National Oceanic and Atmospheric Administration, collects krill that died en masse along a beach near Homer, Alaska. Tests later showed the dead zooplankton were loaded with toxins associated with a harmful algal blooms. 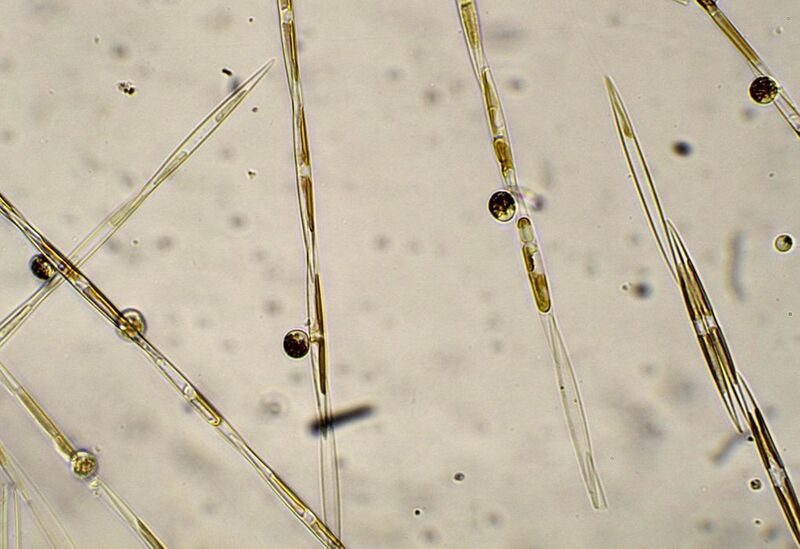 If you look at seawater under a microscope, what you see may resemble a weird alphabet soup: tiny photosynthetic organisms that can resemble stacks of slender Lincoln logs, stubby mushrooms, balloons, segmented worms, or mini wagon wheels. Some float about in currents; others propel themselves through the water column. As conditions change, the environment can become perfect for one or two to take over. Suddenly these algae may bloom. Algae is essential for life, but some species and some blooms can trigger serious harm. Some poison the air people breathe or change the color of the sea. Some accumulate in fish and shellfish, causing seizures, stomach illnesses, even death for the birds, marine mammals, and humans that eat them. Some blooms are so thick that when they finally die they use up oxygen needed by other animals, and leave rafts of dead eels, fish, and crabs in their wake. In 2015, as a blob of warm water along the U.S. West Coast was breaking temperature records, regular sampling showed that dangerous levels of the biotoxin domoic acid from the algae Pseudo-nitzschia was building up in shellfish. Short-term harvest closures for razor clams and crab aren’t uncommon because while domoic acid doesn’t hurt shellfish, it can cause seizures and death in people who eat infected creatures. While scientists knew domoic acid accumulates in the head and guts of fish—which are often consumed whole by marine mammals and birds—researchers rarely find these water-soluble toxins in the parts of fish that humans eat. And where most blooms last for weeks, this one dragged on for months. And while most are localized, this one covered vast areas of sea from Santa Barbara to Alaska. So when Kudela and his crew started testing, they found trace amounts of the toxin in the meat of rockfish, halibut, lingcod, and nearly every fish they tested. In anchovies it was far beyond what regulators consider safe. And climate change isn’t just about temperature. It will also change how storms and melting ice add moisture to the marine world, make the oceans more corrosive, and alter the mixing of deep cold waters with light-filled seas at the surface. All of that can and will affect how harmful algae grow. Joaquim Goes, a research professor at Columbia University’s Lamont Doherty Earth Observatory has been trying to track climate’s role in transforming one of the world’s rapidly changing marine environments, the Arabian Sea. In the early 2000s, scientists documented blooms of shimmering bioluminescent Noctiluca scintillans, a beautiful green algae that can make the sea light up and sparkle. Now it shows up every year, in ever larger densities and covering more area. “Globally, I’ve studied lots of ocean basins, and here the change is just massive—this one species is just taking over,” Goes says. While it’s clear that rising use of fertilizers and massive population growth without corresponding wastewater treatment in places like Mumbai and Karachi are helping fuel this massive change, Goes and some others think that is not the only factor. Rapid melt of Himalayan glaciers is altering monsoon patterns, he says, intensifying them and helping reduce oxygen levels in surface waters, making them more conducive to Noctiluca. That, in turn, is changing what lives there and what they eat. After toxic algae was believed to have helped kill dozens of fin and humpback whales in the Gulf of Alaska in 2015, scientists raced to respond to other whale strandings, including this orca, which washed up dead near Petersburg, Alaska, in October. An investigation later showed it likely died of natural causes. Goes fears these changes ultimately could spell disaster for that region’s fisheries, which provide tens of millions of dollars and help support life for 120 million people. Thus far, the creatures that most seem to like to eat this algae are jellyfish and sea-centipede-like creatures known as salps. Those, in turn, are eaten by animals that can thrive in low-oxygen environments, namely sea turtles and squid. Landings of squid already are on the rise in places like Oman, Goes says, while tuna and grouper catches are down. And the low-oxygen environment itself can have acute effects. Just last fall, low-oxygen water along the coast of Oman killed fish for hundreds of kilometers. Still, it’s not always obvious what the trends really show or how all these pieces fit together. Charles Trick, with the University of Western Ontario, says the physics of ocean environments are so complicated that climate change is likely to worsen algal blooms in a select few places, but not necessarily as a general rule. He is skeptical about climate impacts on blooms in the Arabian Sea, for example, but believes environments like the U.S. West Coast are prime for more massive blooms. What information there is often isn’t so clear. Kathi Lefebvre, with the National Oceanic and Atmospheric Administration’s Northwest Fisheries Science Center in Seattle, has been the one tracking the domoic acid in hundreds of marine mammals in Alaska. The discovery in walrus, bowhead, and other Arctic mammals was a surprise, but it’s not clear if it’s part of a new trend—or simply the way things have always been. No one had ever checked before, so there is no past for Lefebvre to compare to. “It’s a weird thing—we saw domoic acid in every species we looked at, so they are all being exposed to it,” she says. But domoic acid in high doses sometimes leads to seizure and death, which had never been documented in the Arctic. Has it happened all along, but the region is so sparsely populated that no one noticed? Or are these blooms moving north and still building, potentially responding to warming waters and melting ice?